D-Day at Omaha Beach, published and reprinted recently by Decision Games, is a solitaire offering that lets the player take control of the US 1st and 29th Divisions in a bid to storm Omaha Beach on June 6, 1944. Designed by John H. Butterfield (of "Ambush!" and "RAF" fame), the game is primarily card-driven. A typical turn will have the player drawing a card to see what happens to his units about to land on the beach, then draw again for special events, and then once more to see which German units fire and what American units are hit. The US player then gets a handful of actions (moving, attacking, etc.) for his units in each division. A little while back, I wrote an article about my own Lock 'n Load tactics and how they had changed over time, especially in terms of how to use specific kinds of units for attack and maneuver. Today, I'd like to broaden out into the conceptual and just talk about the way I try to approach each game in order to get the most tactical bang for my buck. Generally speaking, I try to set up and use my forces in a way that creates dilemmas for my opponent. When I use the word "dilemma", I'm referring to a situation that presents the opponent with lose-lose choices. Note that this is much different that the word "problem", which refers to a bad situation that can be resolved with a definite solution. Good players are good at creating problems but great players are able to create dilemmas. For more information about how these two terms are used and thought of by military planners, check out pages 1-22 and 1-23 of US Army Field Manual 3-21.8 right here. One of the things I love about older games is that much of the cover art has been hand drawn and/or painted by some very talented people. The best cover art can spark the player's imagination and pull them into the game - or at least get it from the retail shelf to the cash register. It's amazing to see the level of detail and love that went into some of these games. For that reason, I just want to write an article in appreciation of this by pointing out my top 5 favorite old school box covers. The criteria is that the game has to have been released prior to 1990 and I must actually own the game. Last month, I posted a short review of Fire Team, a tactical squad based game set in World War III. I've had a bit of time to sit down and play this West End Games offering from 1987 and I'm enjoying it for the most part. There are some holes in the rulebook and one or two things that don't seem to make sense, but overall I'm happy I bought it. Today, I whipped out scenario 2 from Fire Team, "Reconnaissance on the Nuremberg Highway" and played through it. The situation is that the US 2nd Armored Cav has sent out a small task force to find the Soviets advance down the Nuremberg road. 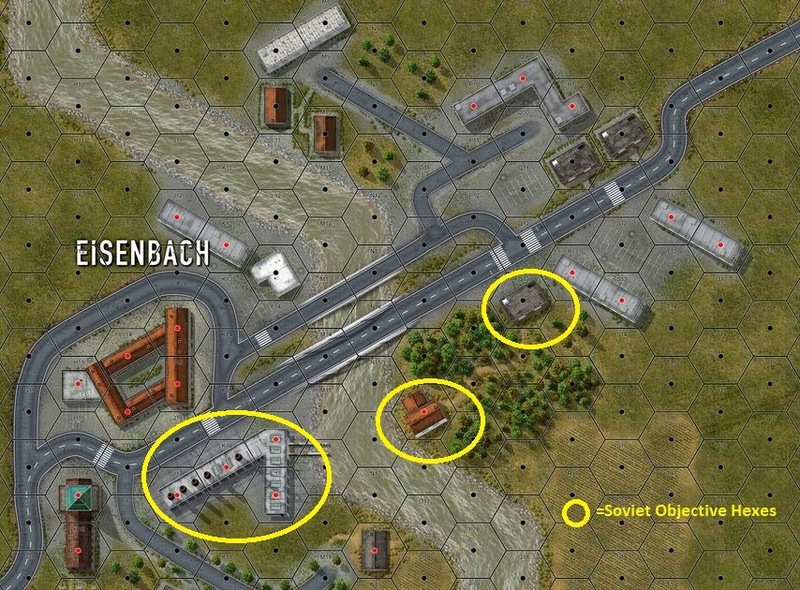 To win this scenario, the Soviets have to get two vehicles from the same platoon off the north side of the map in five turns. The Americans gain victory by preventing the Soviets from doing this and by inflicting losses. River of Perfume is a small 7-turn scenario that takes place during the battle for Hue in 1968 just after the Tet Offensive. It pits the United States Marine Corps versus the Viet Cong in a pitched battle. This differs significantly from the usual hit and run scenarios that feature the VC. Instead, we get a stand-up fight over the control of a handful of buildings. The Marines' task is not easy - they need to have control of 5 buildings on the map by scenario's end. Any other result is a VC win. The VC set up first. They have two leaders, Arnat and Dobie-san, as well as a hero with a Rage card. They basically start with three buildings - one in the center of the map board and two others to the south.